Things are beginning to warm up a bit within the club as the build up to the new season begins. The most important news was the signing of Lee Fowler (left) on Wednesday. The much travelled midfielder joined up with us on a two year contract from Doncaster Rovers following their promotion back into the Championship last season, a season that he didn't play much part in. Lee ended his season out on loan at Forest Green in March and then finally at Burton in April, both clubs he had previously played for. He comes with the reputation of being a battler and an excellent passer of the ball but his disciplinary record isn't the best so that will need to be tightened up. Something I am sure that Steve Burr is capable of achieving considering Lee Vaughans reputation before he came to us from Telford. That now seems to be in the past and hopefully Fowler will become equally as good as Vaughan. 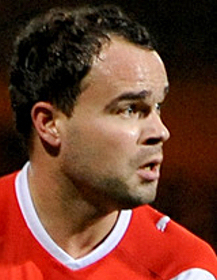 On the way out of Aggborough was Danny Pilkington after just one season with us. Sadly the touches of skill that he showed all too rarely for us was probably down to his injury problems. Now Hereford will be his new home and it's hoped that he can kick on with them and avoid a repeat of his season with us. We'll find out come Christmas when we meet the Bulls for our festive derby games. Steve Burr said earlier today that we'll now see just one more signing and hopefully that'll be a defender to cover both Vaughan and Mickey Demetriou in any emergency. He'll still be bringing some triallists in during the friendly games and obviously if any of them stand out then they should be able to add to the squad depth and help us to achieve an even higher placing than second next season.